By taking advantage of food when it’s on SALE, will save you money! By preserving your food in season will enable you to eat the same during the winter! For example, we recently purchased a large quantity of bananas while they were on sale for a very low price. We dehydrated them because they make a great snack (dehydrated banana chips) and they taste good in cereal. Slice the banana into thin 1/8 inch slices, about the thickness of two quarters. Use a thin sharp knife or you can speed the process with a banana slicer. Pretreating the banana slices with a citric acid solution or lemon juice solution helps to keep them light-colored and serves as an antimicrobial treatment. To make a citric acid solution, mix 1 teaspoon of citric acid into 1 quart of cold water. OR, use a lemon juice solution which is made by mixing equal parts of lemon juice and cold water. To pretreat the bananas, soak the slices in a bowl with the solution for ten minutes. Remove and set aside to drain before filling dehydrator trays. Then place the slices on your dehydrator trays and set the temperature to 130 degrees-F.
Dehydrate until leathery. Thicker slices will take longer. Sample them as you near the end of the dehydrating process. The actual time to dehydrate depends on how moist the food is, the thickness of the pieces, the humidity in the air around you, and the temperature setting of the dehydrator. For banana slices, I found that it takes between 6 – 10 hours with our Excalibur food dehydrator depending on the conditions mentioned. We like to store many of our dehydrated foods in canning jars. The lid keeps the air out, and the glass is perfect for quickly identifying what’s inside. Anybody have tips for keeping fruit from sticking to the trays? I have had a tough time when dehydrating fruit (mostly strawberries and bananas) with them sticking. I use plastic window screen cut to fit my trays. The food when dry can be peeled off. To keep bananas and strawberries from sticking so bad I use the small mesh insert and when they are fully dried you can pick it up and fold it and it really makes sticky fruits pop off easier. I agree. Also, I’ve found that the trays of the Excalibur are pretty well non-stick as is for most things. Dehydrating tomatoes can be sticky, but a trick is to cut them in small wedges and place them on the trays with skin-side-down (wedge pointing up)… no stick! You can also line the trays with wax or parchment paper. A little more time consuming, but it works. 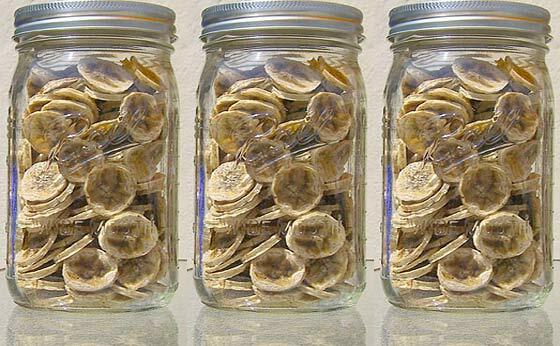 Homemade banana chips are sooo much better than store bought. Pineapple is the best… Keeps a fairly long time, taste amazing! (Keeps all the sweetness) and is extremely High in Vitamin C, so a good item to have around and eat a few here and there. It is prepper candy! Thanks for the suggestion. I’ve not tried pineapple yet… but it sounds good. will they get crispy cause I have had them in the dryer for 11 hours ? They will be drier and thus harder but not “crispy”. Crispy banana chips are baked with oil. I like to use coconut oil to coat the racks of my dehydrator; it works and is healthy and complements the flavor of fruit well. If more than an eighth thick it can take up or over 15 hours. I bake my banana slices for 16 hours and they do come out crisp. I use a Nasco 75 pro dehydrator and use the hand held banana slicer to keep the slices the same thickness. Try putting the racks in the freezer for awhile and then they pop off! We usually leave them overnight, but just long enough for them to cool off the rack is enough! I tried to dehydrate bananas. but problem is banana gets sticked to plastic mesh of racks. They were so sticky I had to use scrapper to remove them from mesh. please suggest some solution ? After you slice the bananas place a few at a time into water with lemon juice. Use a slotted plastic spoon to help drain the water mixture off the fruit before you start to lay it on your dryer sheets. Lemon juice mixture helps with the browning, also the stickiness of the banana. Use non metal utensils which also helps with the browning of the fruit. Half way through the drying process use a spatula or roll up the edges of the drying sheets to loosen the fruit then turn it over one piece at a time. Start the drying process again. The fruit will be a dry on the top and sticky on the bottom. Finish processing the bananas. If you still have questions I will keep checking the site on and off.